Alaska Airlines' wanted to convert its eCommerce properties to a responsive design to allow mobile web users to purchase tickets, manage reservations, and consume web content via mobile phone. UX Design Manager. I was responsible for the design of AlaskaAir.com and I oversaw the design and research team. My role on this project was to oversee the overall project and the primary UX designers who researched and designed the solutions and produced the images below. 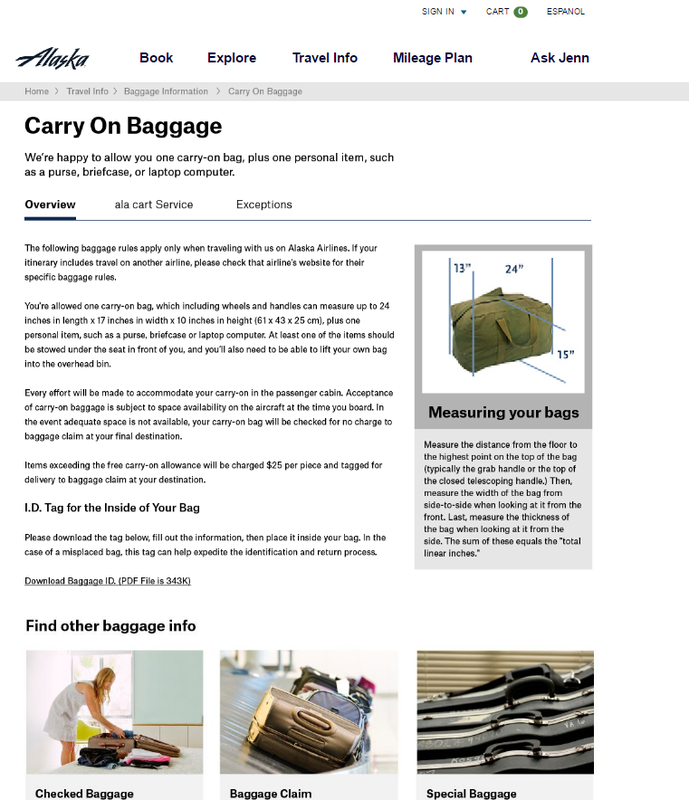 For context, the existing page design featured a heavy amount of text and a left navigation. The existing layout was not responsive, and as is shown below, was nearly impossible to navigate on mobile phones. The prior web experience was dated, had poor visual hierarchy, had a limited navigation system and did not represent the brand well. The website was essentially unusable on mobile. The first step in the process was to survey existing content templates, review the business needs for content pages , review usage metrics, and most importantly review customer behavior and expectations around content pages. From there we began to review other companies' approaches to content page design, ideating with front end developers and content producers on possible solutions. The design work started with whiteboard sketches and led to low- and medium-fidelity concepts. Here are some of the concepts explored. My team produced several concepts of the desktop and mobile versions at various breakpoints for user research and stakeholder input. Here are some examples of their wireframes. These concepts led to a series of customer usability studies, both online via unmoderated testing tools as well as in person at the airport. This research helped us determine which concepts provided the most usable navigation as well as which concepts customers preferred. One of the dozens of user tests we conducted on the experiences. We ultimately conducted dozens of usability sessions with customers both in-person and remotely. The concepts moved from medium fidelity prototypes to high fidelity prototypes during the testing and iterations. We also conducted several design reviews/critiques to mature the concepts. The final designs were rolled out in early 2015 with a selection of high trafficked sections of the site. As those proved effective the rest of the site is being migrated to the new standard. And here's how the responsive content renders on a phone.